It has been said that there is a fairy for all things in nature. This A Touch of Frost Fairy Statue is a lovely image that depicts the change of seasons, showing the warm colors of autumn tinged with the chill beauty of winter. Everyone has that one piece of interest they love. For the fairy lad in the Acorn Fairy Boy Statue, that thing is acorns. 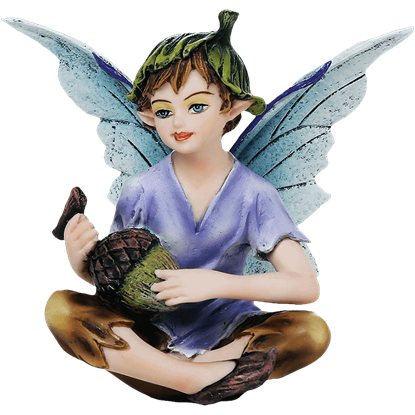 Crafted from cold cast resin, this charming fairy statue has been hand-painted to enhance quality and detail. The Addison Fairy Statue by Myka Jelina features a fairy dressed in purple and orange sitting on her knees with her hands down. Her butterfly wings are outstretched behind her, and a tiny butterfly rests in her short purple hair. As the days grow colder, the hunters grow bolder. While they are permitted to hunt, they are under the command to take only what they need. The fairy of the Admina of the Red Wolves Statue observes them to ensure this law is obeyed. Sometimes, the moon appears as white as snow, while on other nights, it is as red as blood. 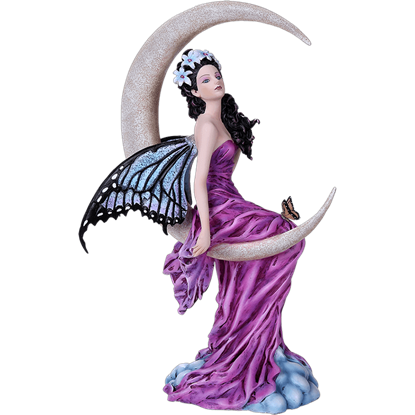 But on rare eves when magical beings like the one depicted in the Amethyst Moon Fairy Statue come out to play, it glows a special shade of violet. Placing an elegant hand over her heart, this water fairy promises to protect the beautiful ocean shores entrusted to her care. 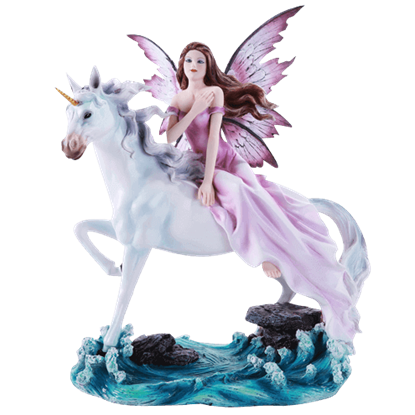 Let all who view the Amidst the Waves Unicorn and Fairy Statue find inspiration from her deep devotion. The name Aneira is loosely translated to mean snow. 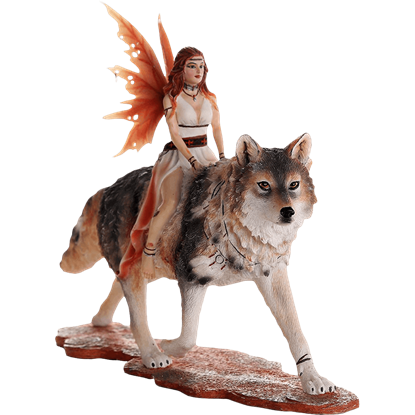 How fitting that the fairy of the Aneira of the Winter Wolves Fairy Statue should be given that name, she and her wolf companion embodying the winter season in all its frozen glory. Fairies and flowers have long been companions, due to how fairies live with and look after all that lies in nature. 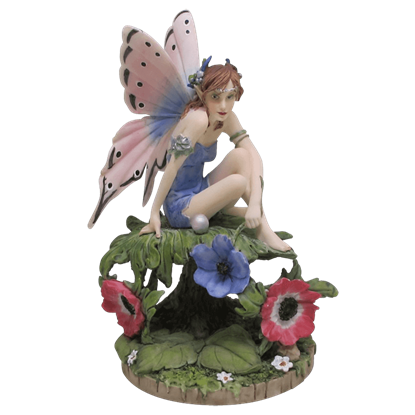 In this Anemone Fairy Statue, the duo featured is a lovely fairy seated with beautiful and colorful anemone blooms. Water is a powerful force that teaches humans time and time again that it cannot be controlled. 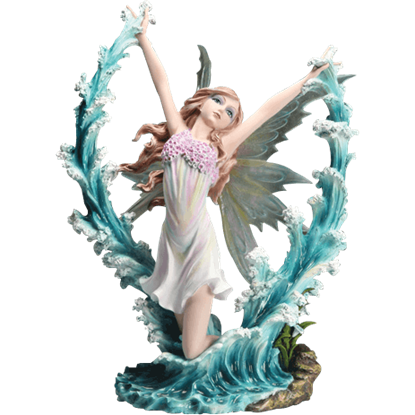 Of course, when you have magical abilities, it may be a little more willing to bend to your will, as demonstrated by the Aquatic Fairy Statue. Fairies can embody any concept in nature. This one embodies the dark beauty and grace that can be found in spiders of all sorts. 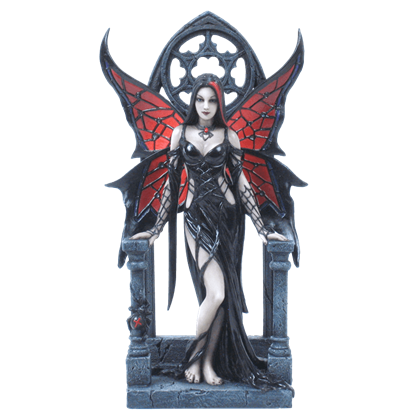 This Aracnafaria Statue depicts a beautiful fairy that could be the human form of a widow spider. A chilling wind blows and the mournful howling of a wolf pack echoes through the mountains. 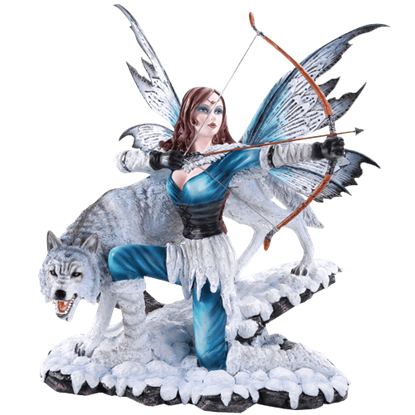 A curtain of snow parts to reveal the Artic Fairy Archer with Wolf Statue ready to let lose a lethal arrow, prepared to protect her realm. 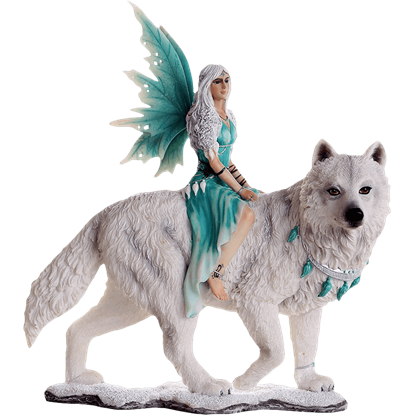 The fairy depicted in the Arctic Wolf Fairy Statue sits hunched over with her head resting on one knee, gazing out pensively. She wears a hood made from the pelt of a white winter wolf, matching her boots and the trim on her gloves.